Patch 5.1 brought with it a very interesting new feature that potentially makes gearing up your character a little bit more interesting and confusing than it already was. This new feature is the ability to upgrade high level items by using either justice of valor points for PVE gear or honor or conquest points for PVP gear. Patch 5.2 took this ability away from players, but Patch 5.3 brings back the Voidbinders and the ability to upgrade items once more. 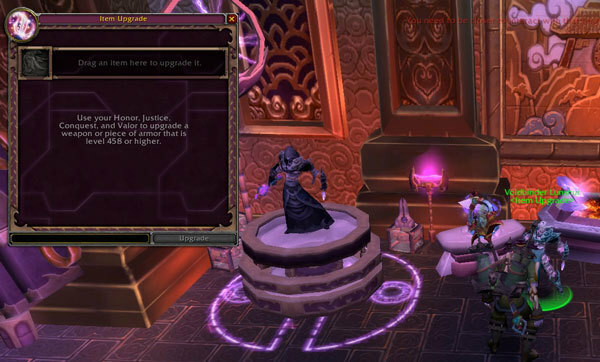 You can find a Voidbinder Ethereal that allows you to upgrade your items in capital cities in the same location you would find the other Ethereals that allow Transmogrification, Reforging, and Void Storage. You can upgrade most PVE items that are item level 458 or higher. You can upgrade only Malevolent Gladiator's Conquest (Season 12) and Dreadful Gladiator's Honor (Season 12) items. Items that can be upgraded will show a new line on the items display that shows Upgrade Level 0/1 or 0/2. Item upgrades are neither refundable nor reversible, so be careful. 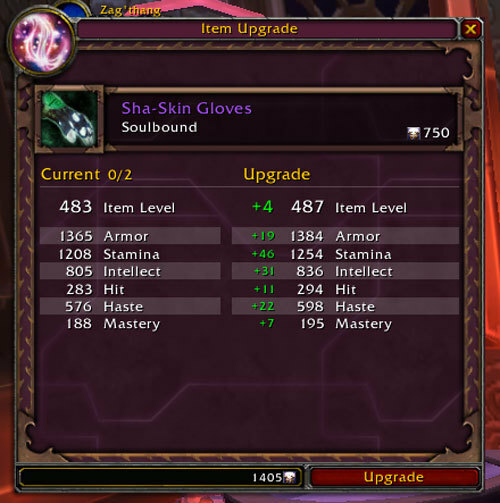 Enchants and gems in a piece of gear being upgraded are not affected. When you want to upgrade an item, simply head to a capital city and find the Ethereal area. Once there find the item upgrader and talk to him. Drop the item you are considering upgrading into the display box and it will show you what the upgrade will cost and how the stats will improve. IMPORTANT: Be aware that trinket procs will be upgraded as well as stats on them, however at this time the proc upgrade does not show in the preview. This new feature allows you to spend those extra justice, valor, honor, or conquest points to upgrade the gear that you really need to keep, but want it to be a bit better. It is important to remember however that upgrading gear is expensive point wise, so unless there are no reputation items left as upgrades for your character it is probably better to use them for purchasing better items than upgrading items that you already have. The priority list above is based simply on the amount of stats allocated to items of the same ilevel across different slots. An example of great items, regardless of slot, to upgrade are tier set items. For example certain tiers of gear grant such good 2 or 4 piece set bonuses that players keep them for a long time, even after the next tier set comes out.